While the Dutch only colonized the North American New World for a period of approximately forty years before the English conquered their territory, their influence can still be felt throughout a great deal of US culture. Here are seven surprising ways the Dutch still affect today’s American society. The Declaration of Independence was most likely based in-part on a 16th century Dutch document. 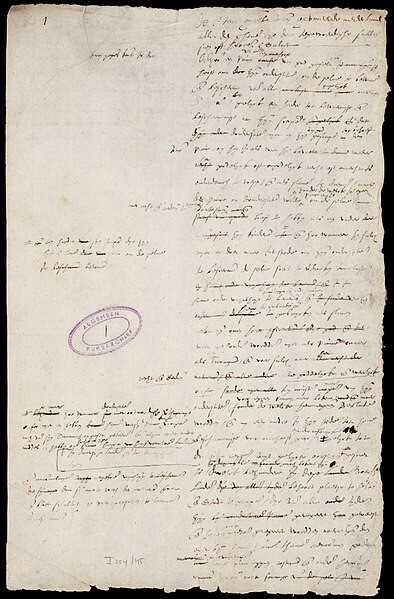 The first page of the Dutch Act of Abjuration, written in 1581. Public domain image via Wikimedia Commons. While we commonly think of the Declaration of Independence being based on the ideas of Enlightenment thinkers such as John Locke (who wrote about “self-evident” truths), some experts believe that the Declaration was based at least in part on the Dutch Plakkaat van Verlatinge, or Act of Abjuration. The Act of Abjuration was written in 1581 to assert Dutch independence from Spanish rule, and contains several parallels with the Declaration of Independence, including the famous preamble which asserts the right of citizens to revolt against tyrannical rule. Both documents also present both a catalog of concerns and grievances to prove oppression by either Spanish or British rule respectively, and a record of attempts to mediate these concerns within already existing legal or civic channels. New York was once called New Netherland. A 17th century map of the East Coast of North America, including the area of New Netherlands. Reprinted from Food, Drink, and Celebrations of the Hudson Valley Dutch by Peter G. Rose courtesy of the collection of Joep de Koning and Foundation for Historic New Amsterdam (pg. 20, The History Press, 2009). 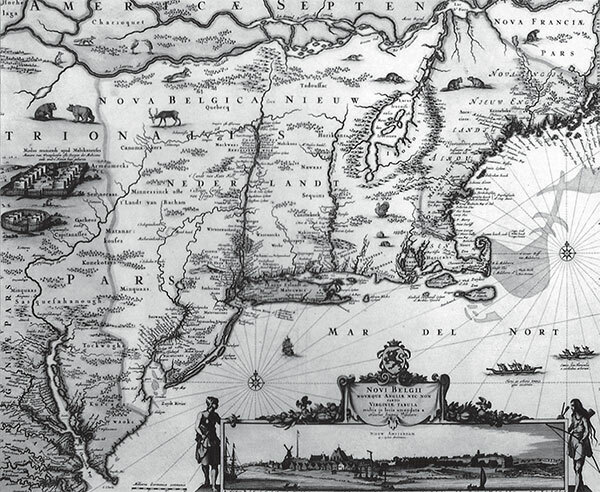 Although it may be common knowledge that New York was a Dutch colony prior to the Anglo-Dutch wars, the Dutch colony of New Netherland encompassed far more than the Hudson River Valley. In fact, the Dutch claimed land as far south as the Delmarva Peninsula near Maryland and Delaware, and extended up to the southwestern outskirts of Cape Cod. The majority of the Netherland’s colony comprised sections of present-day New York, Delaware, New Jersey, and Connecticut. After losing the last of the three Anglo-Dutch wars, the Dutch seceded their claim in the New World to the British, at which point New Netherland was broken into its various succeeding colonies. The Dutch language had a profound impact on the development of modern English. Modern English includes a litany of words adopted from other languages, but the Dutch language has contributed to the abundance of English words that are used in day-to-day life. For example, the city of Brooklyn can thank the Dutch town of Breukelen for its name. Words such as “bundle,” “cashier,” and “bamboo” can all be traced to Dutch roots as well. In total, words either in Dutch or with a Dutch origin account for 1% of the modern English language – this might not sound like a lot, but with only 750,000 words in the English lexicon, the English language can thank the Dutch for approximately 7,500 words in total. New York City’s classic architecture has strong Dutch roots. Despite their minimal presence in North America, several buildings from the Dutch “New Amsterdam” remain in modern New York City. For examples, sites such as the Wyckoff Farmhouse Museum in Brooklyn or Richmond Town in Staten Island date back to the colonial Dutch period, and serve today as popular tourist destinations. The classical Dutch style also saw another heyday during the turn of the 20th century, when Americans began to develop nostalgia for their colonial roots. As a result, there are several buildings throughout New York City and the Hudson River Valley that include Dutch architectural staples, such as gambrel roofs and curved eaves. The Dutch may have unintentionally influenced the US Constitution. 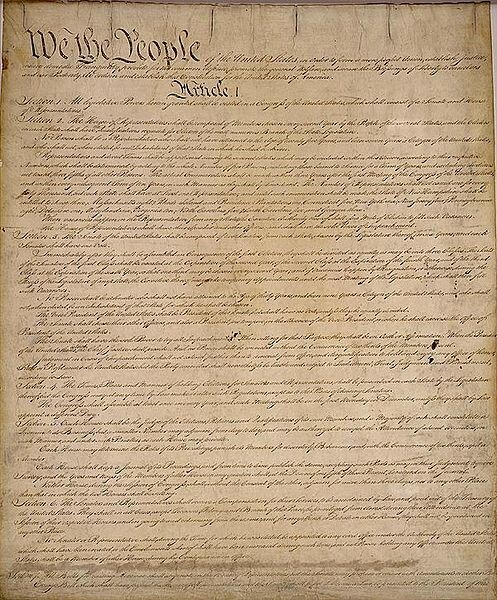 The first page of the US Constitution. Public domain image via Wikimedia Commons. While the Declaration of Independence may have been modeled after the Dutch Act of Abjuration, the Dutch government served as a point of reference and critique during the formation of the US Constitution. In Federalist No. 20, James Madison critically examines the government of the Dutch Republic. At the time, the US was governed according to the Articles of Confederation, an agreement formed by the original 13 colonies after the Revolutionary War. Both the Articles of Confederation and the contemporaneous Dutch Republic focused on having a weak, decentralized federal government, a choice that Madison argued was insensible for the Union as it began to accrue more states. He also claimed that the Dutch Republic’s decentralized government was to blame for the country’s “war and uprising” (although the Dutch were involved in no active conflict at the time of Federalist No.20’s publication). When the US Constitution eventually replaced the Articles of Confederation, it focused on building a stronger and more centralized federal government to oversee the growing number of states. The flag of New York City still showcases the metropolis’ Dutch heritage. Left: The flag of New York City. Right: The Prince’s Flag, the official flag of the Netherlands until 1630. New York City Flag image under CC-BY-SA 3.0, via Wikimedia Commons. The Prince’s Flag image public domain via Wikimedia Commons. The current flag of New York City, which was adopted in 1915, pays homage to the history of Dutch colonization in the area. The tri-colored white, blue, and orange design is meant to replicate the colors of the Dutch Prince’s Flag, which was the official flag of the Dutch Republic until 1630. Consequently, the Prince’s Flag would have been flown in the original colonial city of New Amsterdam when the city was founded in 1609. Today, the flag of New York City is raised by all city-owned buildings, and in the city’s public parks. The Prince’s Flag has since fallen into disuse in the Netherlands after developing socialist and Nazi connections during World War II. The Dutch contributed to the American understanding of freedom of religion. Although freedom of religion is now considered an inalienable right within the United States, many of the people who first voyaged to the New World were attempting to escape religious persecution. The colony of New Netherland subsequently became a safe haven for those seeking freedom to practice the religion of their choice. However, people came to New Netherland from more than just Europe – those seeking to escape the confines of Puritanical society in New England regions like Boston and Rhode Island also came to New Netherland. As a result, the colony was one of the first to hold a truly cosmopolitan and blended society in the New World, setting the foundations for one of the leading tenets of modern American society. To learn more about the Dutch colony in America, check out Peter Rose’s Food, Drink, and Celebrations of the Hudson Valley Dutch. Were you aware how much the Dutch have contributed to modern America, or does your family have Dutch roots? Let us know in the comments below!